You like cascading waterfalls, river views and beautiful countryside. If that doesn’t apply to you, the Poughkeepsie Galleria might have some good sales going on right now. The Falling Waters Preserve is just pleasant. You won’t find huge, mind-blowing waterfalls here (if that’s what you’re looking for, you’d be better off visiting Katerskill Falls, Verkeerderkill Falls at Sam’s Point, Bash Bish Falls or Indian Brook Falls), but you will find two separate burbling streams that cascade over rocks, complete with nice benches that dare you not to take a load off for a few minutes. You’ll also walk right out to the shore of the Hudson River, in one of the few places where you can do so without having trains getting all up in your grill. Oh, and there are picturesque Catskill-and-farmland views, too. And more benches, in case your legs fell asleep while you were sitting on the other ones. Whew, gotta rest. Such a beautiful spot. 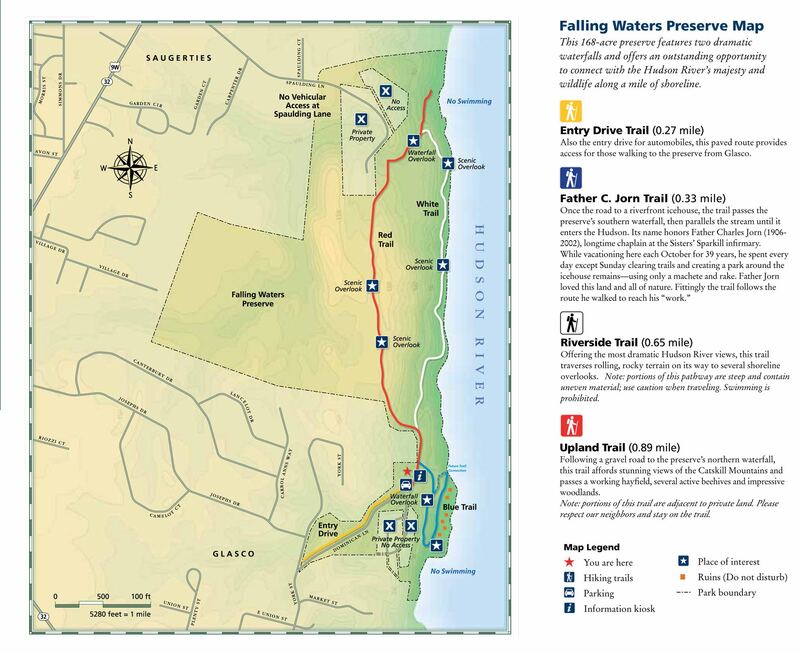 My only hesitation about writing a trail guide for this fantastic place is that it’s a Scenic Hudson preserve, which means there’s already an awesome, informative web site with a great trail map. You don’t need me at all. But you know what? We’ve come this far. Let’s bust out a trail guide anyway. 1. From the parking area (see “Directions to the trailhead” below), stroll over to the well-marked kiosk behind the fence to read up on the place you’re about to visit. Might as well learn something while we’re here. 2. We’ll begin by walking past the kiosk on the gravel road for just a moment, following the red blazes of the Upland Trail. After less than a minute, arrive at the junction with the blue-blazed Father C. Jorn Trail. Turn right to hop on the Blue Trail, which takes us on a loop and returns us to this spot. 3. Is that falling water you hear? Indeed. In just a moment, arrive at your first falling water of the day. Feel free to sit for a moment and meditate on the nice bench-and-arbor setup they’ve got going here. Sure, we’ve only been hiking for two minutes, but it’s important to pace ourselves. Anybody bring Cheetos? 4. Keep following the blue blazes downhill to find another nice bench overlooking the Hudson River shoreline. 5. Once you’re done frolicking in the waves (you’re not really supposed to frolic in the waves), keep following the blue blazes to a spot where the trail splits, at a tree with four blue blazes. This is the start of a loop. Let’s choose the path on the right to get closer to the river. 6. Beautiful bench alert! Seriously, have you not sat down yet? 7. Enjoy the river-and-forest views as you stroll along. Follow the Blue Trail all the way out – you’ll see where the other part of the blue-blazed loop rejoins you, and you can keep going out to this little shack by the river. Father C. Jorn’s garage? Actually, it’s an old icehouse, from way back before people realized that they needed to plug in their refrigerators to keep things cold. You’ll find another nice stretch of shoreline here. 8. When you’re done checking out the river, return on the right-hand Blue Trail section that stays a little farther inland, just for a change of scenery. Finish the loop and head back uphill, past the waterfall, to where the Blue Trail began. It took me about five minutes to get back up there. 9. Turn right to continue on the Red Trail, which could easily pass for a gravel road if it needed to. 9. In just a few minutes, you’ll see the white-blazed Riverside Trail splitting off to your right (the white blazes had been ripped off the tree on my visit in late 2012, but I imagine they’re probably fixed by now – Scenic Hudson is on the ball about this kind of thing). Stay on the Red Trail to keep heading toward the falls, and we’ll come back to this spot via the White Trail later. 10. From that Red/White junction, it’s about .6 miles to the falls. Just keep strolling, enjoying the bucolic views to your left. (Also, has anyone ever used the word “bucolic” in conversation? It’s one of those words that people only write, like kudos and ilk.) But are there benches, you ask? Oh yes. Have a seat and continue pacing yourself. 11. When you arrive at the statue of an important-looking person, where a paved road continues straight out of the preserve, turn right to stay on the Red Trail. Hear more falling water yet? 12. As you approach the falls, hop on the little spur trail that takes you down right beside the creek, where there is another nice bench-and-arbor setup. If you didn’t polish off the Cheetos yet, now would be a good time to bust them out. 13. After you’re done checking out the falls, the nicest stretch of trail for the day (in my humble opinion) is just ahead. Hop back onto the trail, following it above and behind the benches. Keep heading downhill, ignoring the White Trail splitting off to your right (we’ll come back here in just a moment). The creek drops into the ravine to your left as you walk high above it, heading down to the Hudson River once again. What a nice spot. 14. The trail dead-ends on a bank overlooking the spot where the creek runs into the Hudson. Take in the view for a moment, then head back up to the White Trail junction. 15. Turn left onto the White Trail. Follow those blazes as you roll over some scenic hills, occasionally dropping down to the river’s edge. And, of course, passing some more scenic benches. You’ll stroll almost a mile on the White Trail as it rolls along the river’s edge. Towards the end, it cuts inland again and dead-ends into the Red Trail, closing the loop. 16. Turn left onto the Red Trail to retrace your steps back to your car. Aren’t you glad you came here instead of the mall? Directions to the trailhead: From the Kingston-Rhinecliff Bridge headed west, take the first exit for Route 32 and go north. Follow Rt. 32 for 4.9 miles, then turn right onto Glasco Turnpike (and we use the term “turnpike” loosely). Continue straight in .3 miles as Glaso Turnpike merges with (and becomes) Delaware St. In one block, turn left onto York St. Are you on the right place? Yes, you’re in the right place. I know, doesn’t seem like it. In .2 miles, turn right onto Dominican Lane, which is nicely marked with Falling Waters Preserve signs. Park in the large lot and let the adventure begin! You can also get directions by checking out the Falling Waters Preserve entry on the HiketheHudsonValley.com Google map. Mike — I believe I would walk any trail you write about. Your humor, great photos and super-clear, detailed (but not overly detailed) directions are seductive. You could send me trekking on Arctic ice floes. As long as there were some great benches. (Ha ha — love all the bench humor!). I plan to visit Falling Waters Preserve soon. Your commentary has made me curious about you. Who are you? A hiker who’s a great writer? A writer who’s a great hiker? What else do you write? Do you have a web site? Well, dang, Constance! We have a “no devices” rule at our dining room table, but I broke it so that my son could read your comment (which is surely one of the nicest I’ve ever gotten) to everyone. “Wait, wait, do the great writer part again!” I said. He’s not a teenager yet, so he actually did it. It was great! Really and truly, thank you so much for all the kind words. I’ve always enjoyed plunking around with writing, to mixed results. I just recently quit writing a weekly humor column (which ran for thirteen years in some small newspapers) to allow more time to focus on this website. I just kind of stumbled into this hobby on a whim, and it’s turned into a really rewarding experience, especially when it benefits cool people who take the time to brighten my day. Thank you so much, and I hope you have a great trip to Falling Waters Preserve! I hear they have some awesome benches there. Hello! I opted this hike as my first ever and wow was it amazing. I took many pictures and some video of the falls. I love the sound of water, and while I sat beneath the gazebo, listening and watching, I was definitely in my happy place. I have a terrible arthritic knee, and though by the time I reached the falls I was feeling some pain, it was definitely well worth it. I’m trying hiking because I want to keep moving, keep my knee mobile and stay healthy while enjoying the beauty of the Hudson valley. Thank you for all your information! So nice the Sisters allow us to walk on these trails. Being new to the Hudson Valley I find your website very informative and useful. I started with the blue trail to the falls. There are a couple of large trees that recently fell, blocking that trail but you can climb over them. I’m sure they will be cleared soon! For me the blue walk would a great place to finish your walk as sitting on the bench at the falls is very zen like besides being cool and refreshing. I was ambitious and then took the white trail and returned on the red trail. I did over do it as both my hips are replaced and I’m feeling the burn now. I will return for the blue walk again! My Chihuahua and I had a lovely day and will try other moderate walks as I become familiar to my new home, The Hudson Valley. Welcome, Jay, and thanks for the thoughts and updates! Here’s wishing you many more happy adventures in your new home. I was curious about the steepness of the trails, how long it would be, and how appropriate it would be to bring small children. It couldn’t have been more helpful, all with a friendly, chillaxed vibe. Don’t think that word’s in the dictionary (yet). Thank you so much! Hi, Jane! If you click on the “Google Terrain map” link at the top of the guide, you can see the elevation profile for this hike — it’s pretty mellow, but there are some hills here. I’d think this would be a great hike for small children, especially around the Blue Trail in Steps 2-8 above. Then you could see how they were doing to see if they wanted to soldier on or not. 2.7 miles if you do it all. Have fun chillaxing out there! Thank you for the great information and directions! This is the second time I have used your great website to find an appropriate trail for myself and my kids (the first was Huckleberry Point). We had a lovely scenic easy hike to wind up our summer. To all the Dominican Sisters: Thank you for all the kind words, and thank you so much for opening this space for us all to visit and enjoy! It really is a special place. Your generosity has made the Hudson Valley a better place for all of us to live and visit. And to the Dominican Sisters in Pakistan, I hope you’ll get a chance to walk these trails in person someday! and rest a moment to view and feel the warmth of God’s creation. Being one of the Dominican Sisters who has walked, prayed and had so many wonderful days on this holy ground, I was so pleased to see the captured beauty in the photos. There is awesome beauty here and since these same grounds were used for many retreats and great joyful gatherings of our Sisters living and deceased…….it adds to what I said above….THIS IS HOLY GROUND! This is beautiful. I love what you have done with Falling Waters. Waterfalls and beautiful scenery are two of my many favorite things in life. Thanks for sharing this. Sitting in Pakistan we utterly enjoyed looking at our own property looking so beautiful. It was awesome, so many Pakistani sisters have not seen these places yet. It was a great help to explain to them how beautiful the Hudson valley is, and we as Sparkil Dominicans Sisters in the desert of Pakistan enjoyed it all the more, and are pleased to know that everyone can enjoy this beauty. informative and amusing write up, ending with gorgeous pics – figures I just moved out-of-state; will make it a point to check out, thanks! Thanks for the nice words, Jennifer! This would be a great spot to visit when you come back.